When I was a little kid, I always was making these tye dye explosive drawings like the one above. I used that as an inspiration for my nail tutorial. I absolutely love how these turned out and here is how I achieved these nails! I purchased the dotting tools on Amazon. They were a little under $2! 1. Apply 2 coats of white for the base color. 2. Decide where you want the center of each exploding section to start. Using the biggest dotting tool, create two dots on each nail for the start of the explosive look. 3. 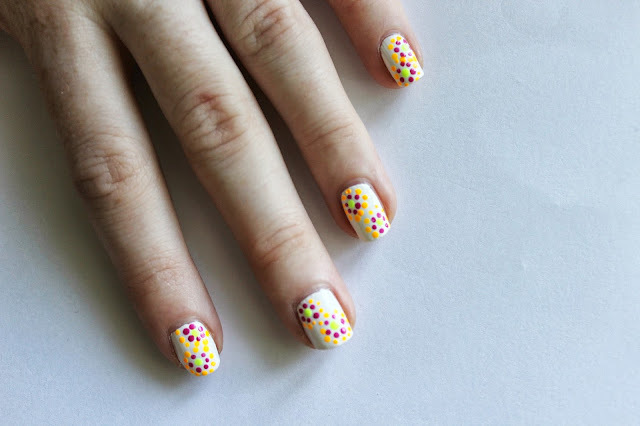 With your next color, creates dots in a circle around the center dot with the second largest dotting tool. 4. Continue with the next color. Using the third largest dotting tool, circle around the last section. This is about the time where the two sections should touch. 5. Continue creating the sections around the last one, starting over with the very first color. 6. Finish with the last section until the nail is completely full, then finish off with a top coat. & you’re done! I love how these turned out! I will definitely being doing this a lot in the Spring! Let me know if you try this out, and share your photos with me on Facebook & Twitter! If you are new to my blog, feel free to follow! I’m also on BlogLovin‘ too! "DIY: Polka Dot Denim Vest"